On Tuesday, March 31, under the chairmanship of His Grace Bishop John of Naro-Fominsk, Administrator of the Patriarchal Parishes in the USA, a regular session of the Bishop's Council was held in the refectory of St. Nicholas Church in Bayonne, NJ. 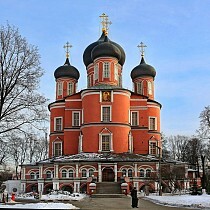 On the evening of the Fifth Sunday of Lent, His Grace Bishop John of Naro-Fominsk visited Three Saints Church during the traditional Lenten Great Vespers served by clergy of the Eastern States Deanery. 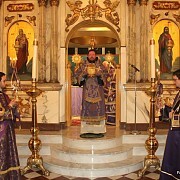 On the Fifth Sunday of Lent, His Grace Bishop John of Naro-Fominsk, Administrator of the Patriarchal Parishes in the USA and His Grace Bishop Nicholas of Manhattan, Vicar of the Eastern American Diocese of ROCOR, celebrated the Divine Liturgy in St. Nicholas Cathedral in New York City. 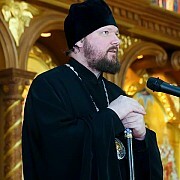 On Monday, March 16, the seventh anniversary of repose of His Eminence Metropolitan Laurus (Skurla), Fifth First Hierarch of the Russian Church Abroad was commemorated in Our Lady of Tikhvin Church in Howell, NJ. 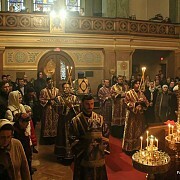 On Sunday, March 15, with the blessing of His Eminence Metropolitan Hilarion of Eastern America and NY, First Hierarch of the Russian Church Abroad, the Administrator of the Patriarchal Parishes in the USA, His Grace Bishop John of Naro-Fominsk celebrated the Divine Liturgy along with Bishop Nicholas of Manhattan in the Synodal Cathedral of the Mother of God of “the Sign". On Friday, March 14, the Administrator of the Patriarchal Parishes in the USA, His Grace Bishop John of Naro-Fominsk participated in the reception in honor of the second anniversary of Pope Francis election as the head of the Roman Catholic Church. On Thursday, March 12, the Administrator of the Patriarchal Parishes in the USA, His Grace Bishop John of Naro-Fominsk, visited the Embassy of the Russian Federation to the United States and met with the Ambassador Sergey Kisylak. 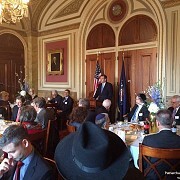 On Wednesday, March 12, the Administrator of the Patriarchal Parishes in the USA, His Grace Bishop John of Naro-Fominsk, participated in the 50th Anniversary luncheon of the "Appeal of Consciences" Foundation. 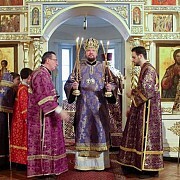 On the First Sunday of Lent, the Triumph of Orthodoxy; with the invitation of the head of the Antiochian Archdiocese in North America His Eminence Metropolitan Joseph of New York and all North America, His Grace Bishop John of Naro-Fominsk, Administrator of the Patriarchal Parishes in the USA celebrated the Divine Liturgy in St. Nicholas Antiochian Cathedral in Brooklyn, NY.